Yes, Bosley can be a little on the pricey side. We say ‘can be’ because it depends on what you order. We each had a glass of wine, split an appetizer, two entrees, and split dessert and before tip our bill was a little under $100. 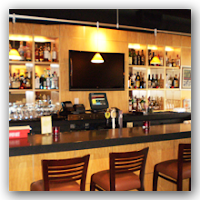 They do have small plates that are less expensive, and a killer happy hour with drinks and appetizers starting at $4. But dinner is definitely a splurge well worth it. Bosley describes their style as “American Cuisine with a Key West Influence.” We’ll admit, that was something that drew us there. Dan has been to Key West multiple times, once with Amanda. Bosley’s menu is chock full of the yummy seafood we remember eating there. We’re not sure about during the week, but weekends are busy at Bosley so make a reservation. Even with ours at 8:30 we still had to wait a little bit for a table to get up, they were packed. Our server started us off with a complimentary amuse bouche (small bite before the meal begins) of a cucumber disk with a goat cream cheese, smoked salmon, and a balsamic drizzle. Dan wanted about 5 more. Next warm bread was brought to the table with chive butter-which was incredible. With it being so busy our food took a little while so this was a good way to take the edge off our hunger. 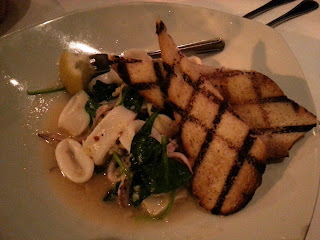 We ordered an appetizer of Sauteed Calamari (with spinach, chili flake, olive oil, lemon). When it was set down you could smell the aroma of garlic. The calamari was tender and had an unexpected kick from the chili flake. Next were our entrees. 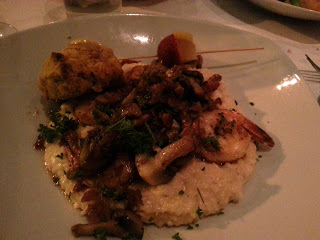 Amanda ordered the Shrimp and Stoneground Grits (grits, aged white cheddar cheese, bacon, mushrooms, sauteed shrimp, cayenne pepper). 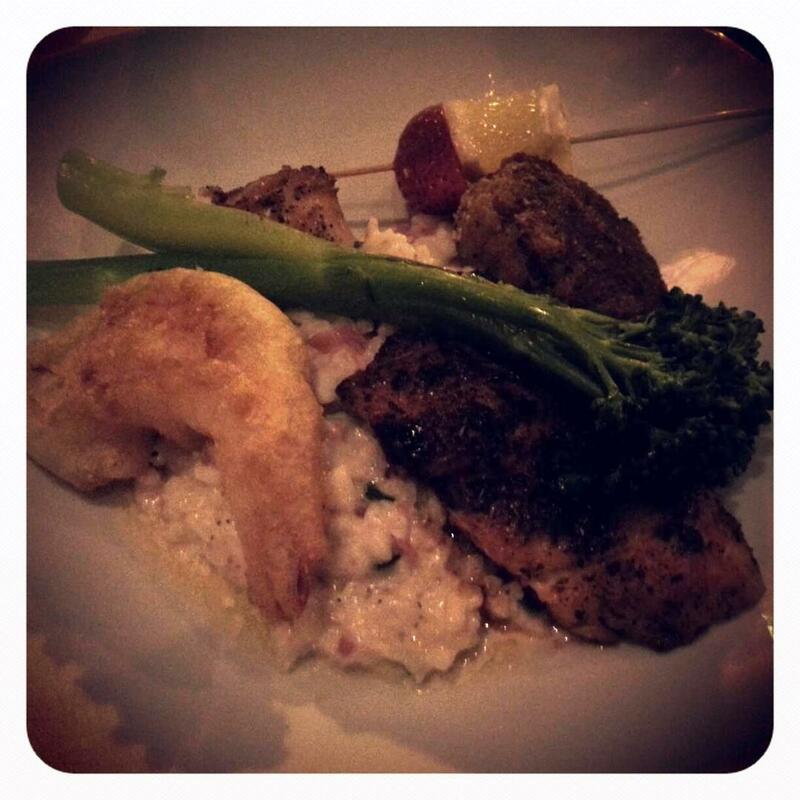 Having had shrimp and grits in the south, this dish was pretty amazing. It didn’t have the tasso gravy, which we thought was a welcome change. The mushrooms, bacon and shrimp must have all been sauteed together because they all had that smoky taste. Grits were creamy and flavorful. A sweet potato biscuit with honey butter was served on the side-dense and moist. We will be looking up a recipe soon and making these beauties. Dan ordered the Seafood Symphony, a menu item that changes nightly. This night the plate included a tempura shrimp, a seared scallop, blackened grouper filet, and a crab cake, all served over bacon leek risotto with a stalk of broccolini. The tempura was crispy and hot, not a hint of sogginess. The scallop had just the right amount of crisp sear. The grouper was not overly salty, which we have found can happen with blackened fish. The crab cake was breaded, different from crab cakes we have had in the past, but crunchy on the outside and creamy on the inside. And the risotto, oh the risotto-life changing. Good thing Amanda stole a bite right away because Dan cleaned the plate! Of course we left room for dessert! We had heard the Key Lime Pie was what Bosley’s was famous for. 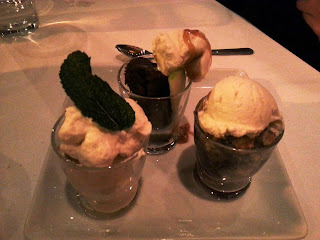 However when we got the dessert menu we saw there was a trio that featured not only the Key Lime Pie, but also Blueberry Cobbler and a Chocolate Ganache Brownie, both topped with Purple Door Ice Cream. Why just have one when you can have three? Our server told us it was a good dessert for two people, giving each person a couple good bites of each. She was right. The desserts came in little glass dishes and were about 4 bites each. The brownie was SO rich (in a good way). Pairing it with ice cream and caramel sauce was a good balance. The cobbler was Amanda’s favorite. Warm cobbler and creamy vanilla bean ice cream are the ultimate comfort dessert. Dan’s favorite was the famous Key Lime Pie. Upon the first bite he said, “I’ve never had a food take me back to a place, but this just reminded me of the key limes we used in our drinks the first time I went to Key West in college.” Tart, smooth, wonderful. 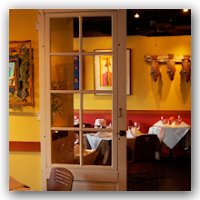 All in all, a really great dining experience. The staff was friendly and willing to give recommendations and suggestions. The bartender was very helpful in choosing a Sauvignon Blanc Amanda would like. Our server made sure we were happy with every course of our meal and that we were taken care of. It also is good when you order something and your server genuinely says, “ooh, that is a great choice. I love that dish.” Nice to see someone who loves what they serve. We will definitely be back, maybe next time to check out one of their happy hours!